Wasabi it’s a special ingredient in Japanese cuisine, which actually grows almost only in Japan. And it certainly is the best here. All thanks to the characteristic climate of Japan. Japan is a land of fertile soil and mineral-rich water. These are necessary conditions for the cultivation of wasabi. This ingredient can be found in many Japanese dishes. The best known are sushi and sashimi, but without the wasabi you cannot do soba too. Raw fish have been eaten in Japan for a long time, and this is possible thanks to wasabi. The cultivation of this plant is very difficult and time-consuming, and in Japan it is still done according to the knowledge used for generations. Currently, wasabi is also used outside the food industry. 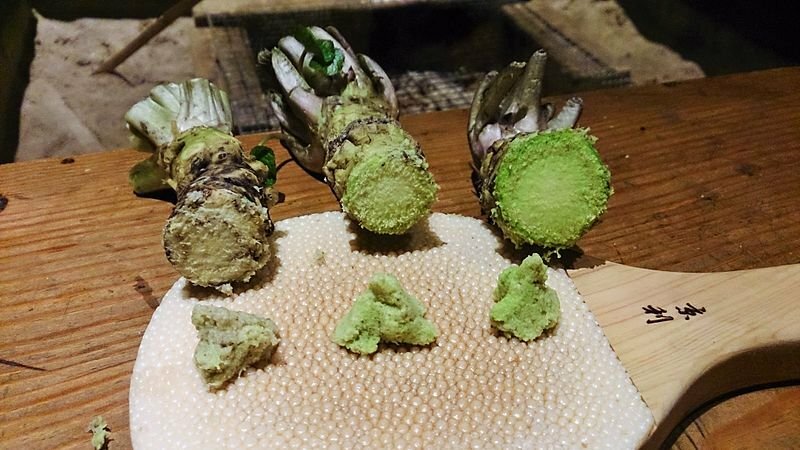 From at least the 7th century, wasabi was used as a medicine, and its cultivation by humans was initiated in the early Edo period, 400 years ago. Tokugawa Ieyasu, First Shogun of Edo, put strict controls on wasabi, and it was a very expensive product. From the early years, people knew the anti-toxicity of wasabi, when it’s used with fish or chicken. Wasabi is a unique plant for Japan, it’s belonging to the family of brassicas. Another member of this family is horseradish. 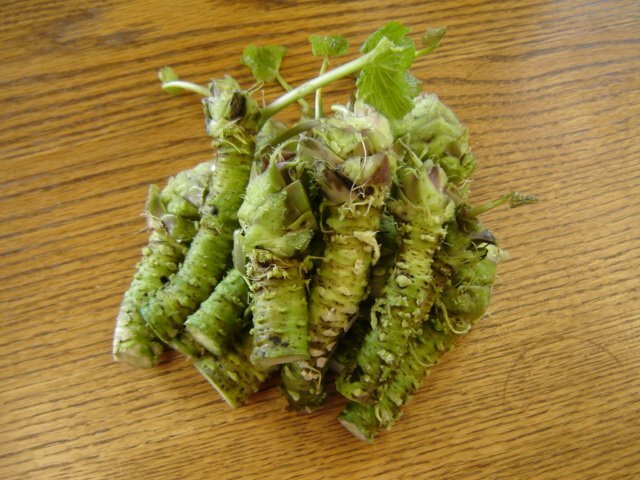 It is much larger than wasabi, it is also harvested in a much shorter time, usually seven to eight months and grown in a regular field. Wasabi is usually grown from one and a half to two years, and sometimes even longer. The taste is also different. Although both plants are sharp and have a “kick” that refreshes the nose and mouth, the wasabi is more delicate and less earthy in taste. Wasabi has an unique taste that is difficult to reproduce when grown outside of Japan. Its aroma consists of several factors that occur only in Japan. It is a mountainous country full of water. Three-quarters of Japan is a mountainous area thanks to which there is a lot of snow and rain. A huge amount of water accumulates in the mountains and is filtered there, and then flows down with the mountain stream. Water penetrates the mountain soil and absorbs natural minerals and becomes spring water. Thanks to this, in Japan there is a lot of crystal clear water. Wasabi is closely related to that. It is a very delicate plant that will not grow well if all conditions are not met. The temperature can not be too high or too cold. Cool mountain areas, where temperature fluctuations during the year are not very extreme, are the best. It is also important that the wasabi receive the right amount of sun. For good development, wasabi needs 30% of the sun and 70% shade, and shades in the mountains is ideal. But the most important thing in the cultivation of wasabi is water. It takes a lot of clean water, wasabi absorbs nutrients from it. Farmers make sure that the water temperature is around 13 degrees Celsius for the whole year. In Izu, Shizuoka prefecture, wasabi is grown using a traditional method. It grows naturally in mountainous areas, and Izu is located in the heart of the mountains. 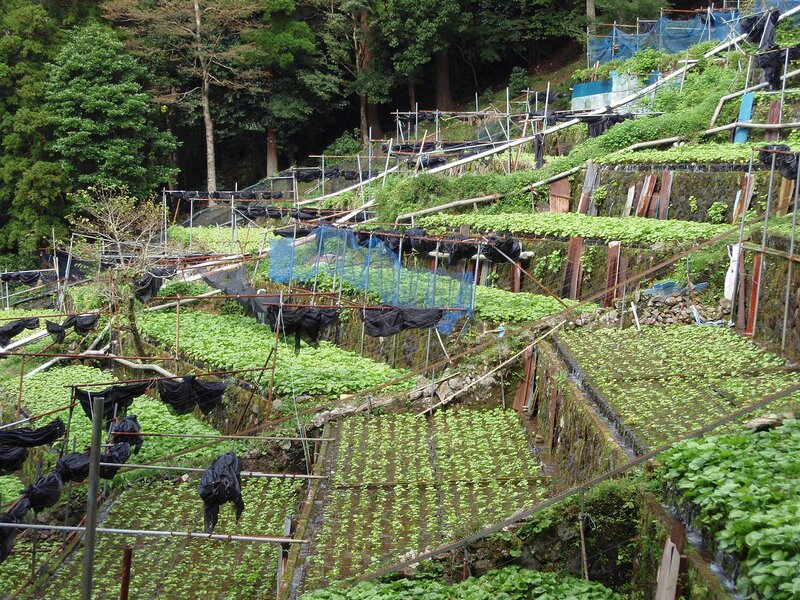 Wasabi cultivation is time-consuming and hard. Farmers climb the unpaved path for more than half an hour, taking boxes with carts with them. The so-called terraced fields where wasabi grow, are similar to rice fields. The fields must be manually cleaned of grass and soil, which in the mountains often pollute the water during heavy rainfall. It is crucial that the water in which the wasabi grows is always crystal clear. Wasabi can also be grown on flat ground, but then it needs special curtains in winter and summer to protect them from too large temperature differences and too strong sunlight. Wasabi sprouts one leaf after another, and because it grows long, to get a good size it needs from one to two years. The pace is also important. when it grows too fast, the taste is watery and weak, when too slow the taste is too concentrated and spicy. This is very important especially in sushi, which wasabi is an indispensable element. It gives sushi some extra kick. Sushi chefs call wasabi a teardrop, because often we have watery eyes when we eat wasabi. Moments later, the palate is refreshed, and the taste of sushi becomes even better. 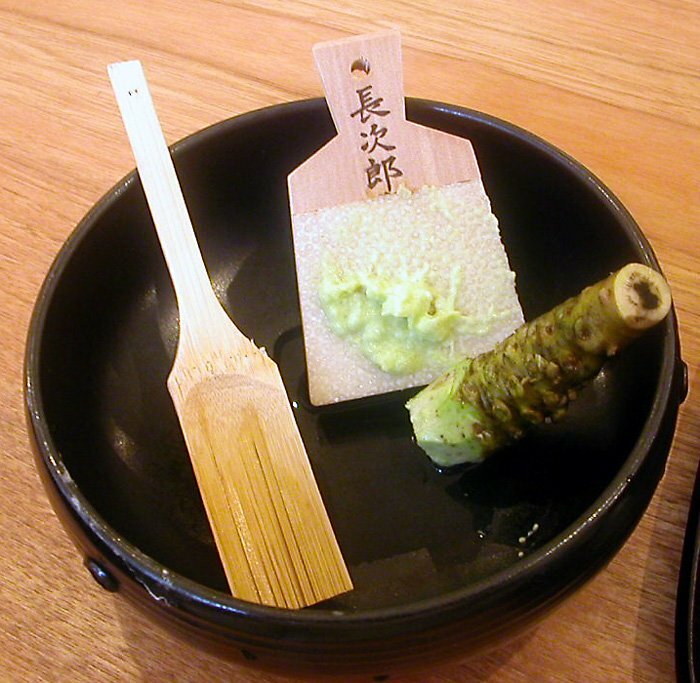 The wasabi root is hand-grated before eating, and its taste depends on the method of grating. In Japan, shark skins is used. It has hard, tiny bumps that allow you to effectively extract the aroma and sharpness of the wasabi. Wasabi is best to start grating from the top of the root, close to the leaves. This is the freshest part, from which the best shredded wasabi is created, both in taste and color. Wasabi must be grated, If you bite off a chunk of wasabi it taste bitter and have no “kick” Wasabi is the best immediately after the grating, over time its taste becomes more soft and mild. Leaves and flowers of wasabi are also sometimes eaten. From wasabi sprouts you can make pickles. First, wash them with water and knead with salt to soften them. Then puts in a bowl and puts something heavy on top to squeeze out the scum. After about an hour, scum and salt should be washed and dried from the water. Then a sauce made of vinegar, sugar and soy sauce is added, then the mixture is sealed and left in the refrigerator for a few days. From the leaves of the wasabi you can make tempura. It is a very popular dish during spring, when the leaves are the tastiest. Wasabi therefore sometimes plays a leading role in the meal and is not just a flavoring. In Japan you will also find many food products that are flavored with wasabi.You can find wasabi chips, and even wasabi beer and ice cream. Wasabi is a very expensive, prices for the best wasabi reach up to 5,000 yen for one piece. Wasabi available in jars or tubes isn’t a real wasabi. You can’t even found real wasabi in sushi restaurants outside of Japan. Typically, they’re using powdered wasabi. Dis-gus-ting! Wasabi always! must be freshly grated. In Japan, wasabi is also used outside the food industry. Wasabi extract is a component of anti-bacterial sheets, which you can put into lunch boxes to prevent the growth of bacteria in food. Such natural remedies have been used for centuries in Japan. Freshness of the food is also prolonged by ume, soy sauce, shiso leaves or daikon turnips. They are used up to today, thanks to which artificial preservatives can be avoided in many cases. Wasabi extract is also used in fire alarms. In the event of a fire, the sensors release the wasabi smell, which wakes up the man after just 2 minutes. Such solutions have been used for several years by deaf people. In addition, research on medications and cosmetics from wasabi is underway. Wasabi is an unique plant that has a versatile effect. I eat a lot of dishes wish ‘wasabi’, sometimes even our Polish dumplings. Of course, this is a “wasabi” from the tube, but even with wasabi in this form you can take the GREAT CHALLENGE OF WASABI. I recommend that ;)! And I also recommend the film!